Fur stoles - Etoles de Fourrures. Modèles de Révillon Frères. Home » Fur stoles – Etoles de Fourrures. 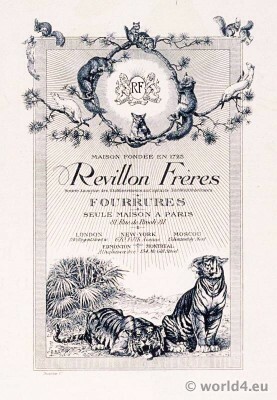 Modèles de Révillon Frères. Fur stoles – Etoles de Fourrures. Modèles de Révillon Frères. Fur stoles – Le style parisien. Plate VI. 1915. Etoles de Fourrures. 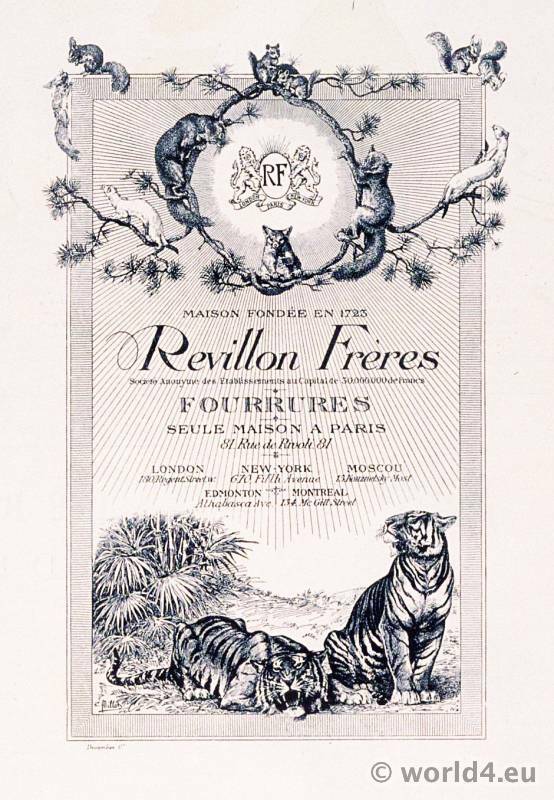 Modèles de Révillon Frères. (Révillon *). Samll cape in skunk forming a peak back and front. The collar is turned back in the shape of a ” col châle “. The two points in front are trimmed with great bows of velvet ribbon to match, fringed with silk. Muff shaped in sections like a melon. (Révillon). Stole in ” martre du Nord ” made in a peak with celluloid buttons imitating marble encircled with golden metal- Soft muff to match. (Révillon). Stole in ermine and skunk. Two front pieces in white passementerie mingled with little tails. The back forms a large collar in skunk. The lower part of the muff is in ermine, the upper part in skunk with the head on the right, the paws and tail on the left, and the wrong side is in velvet matching the skunk. (Révillon). Stole in sitka fox extremely voluminous, rich and expensive in appearance; each side takes two long fox skins, one with the head upwards, the other with the head hanging down. Louis-Victor Révillon established in 1723 the famous leather and fur company in Paris at 159, Rue St. Honoré called la Maison Givelet (Actually 2014 at Paris’ Avenue Montaigne. Artistic director, Andrew Heather, formally at Givenchy). Gallery: Le style parisien. Plate VI. Supplément du ” Style Parisian ” No 3. Le Directeur – Gérant: Lucien Vogel. 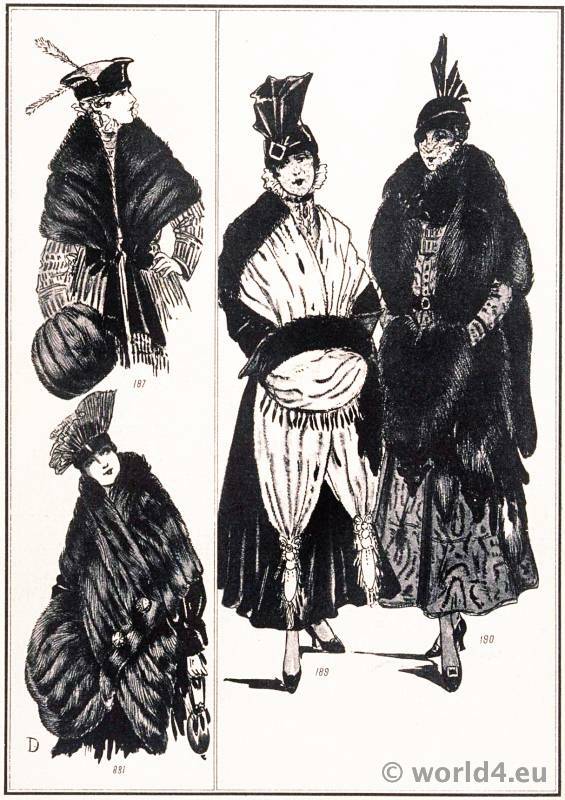 This entry was posted in 10s, 1915, 20th Century, Art Deco Period, Fin de siècle, France, Le Style Parisien and tagged Art Deco Fashion, Belle Epoque Fashion, Fur, Lucien Vogel on 8/6/14 by world4.